I’ve joined a car ‘sharing’ scheme called the Classic Car Club. Rather than own a classic of your own, you buy a share in using many, and then use them for occasional days out. It’s a cheap way to occasionally pretend to be rich and successful. They have an amazing range of cars ranging from the original Mini and Fiat 500 up to classic Porsches and Bentleys. Recently I borrowed my first vehicle – to come up to East Anglia to see Luisa and my Mum. 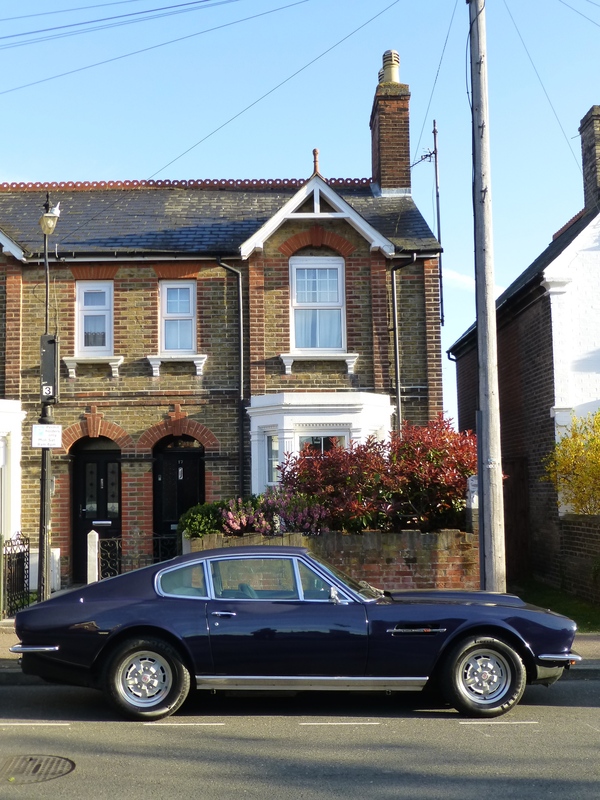 I chose a childhood dream car – the Aston Martin V8. Not the actual car that Sean Connery drove as James Bond, but a later model from 1971. Timothy Dalton (as Bond) did drive this version – so you can see I hadn’t quite got it right. If you remember The Persuaders TV series, this was also the car driven by Roger Moore, as Lord Brett Sinclair. The car I’m about to drive is 43 years old – and will prove you should never meet your heroes, especially in their old age. I cycled to the club’s underground garage (or ‘lair’ if we can stick with the Bond image) on Friday night to collect it. The car felt rather different to my liitle bicycle. Very big and very cumbersome. Driving out onto the streets of London was intimidating. Thankfully, the rumble of its huge 5.3 litre V8 engine was equally intimidating to the London public, who seemed to run for cover. I finally mad e it out onto the M11 for the drive to Colchester. By now I’d realised that while this car made a lot of noise, but wasn’t actually very fast. This was fortunate, because I had also learned it was not very fast at slowing down either. I started leaving big gaps between me and the car in front. It’s hard to believe that when new this car could do 168mph – only once in most owner’s cases I would imagine. Reaching Colchester without any real problems, I was relieved to park for the night. Luisa is not interested in cars, but came out to look and was willing to admit it had some old world charm, even if she could barely open the door. On Saturday morning, we aimed to set off to see Mum at 11 o’clock. I had already learned that starting the car is a complex and slow process. It involves disarming the immobiliser, turning the key as far as it will go – and then pressing a huge starter button, after which the huge engine thunders into clattering life. Except this time nothing happened. A couple of urgent phonecalls to the very helpful chaps at the club could not solve the problem. Instead I had the indignity of calling out the AA. Gosh, the AA man was impressive. He obviously liked the idea of getting an old classic car going – and nothing was going to stop him. He found the break in some spaghetti wiring under the dashboard and had the car ticking over, while he made sure it wouldn’t happen it again. I stood by in admiration – and then noticed the changing state of the white car parked behind the Aston. Well, I say white, it was now splattered in soot and getting blacker by the minute. Once I’d finished washing the neighbour’s car, we were ready to go. I now knew for sure that I was glad I did not have the honour of owning this car. In addition to being hard work, I would be so scared of it breaking down and costing me a fortune. And on the subject of fortunes I then had to buy some petrol. It has two tanks and two filler caps – both needed if you are only doing 12 miles to the gallon. The day went well and the car did a good job of the shopping at Morrison’s – not quite wafting down the Cote d’Azure. Mum found it comfortable and the boot just about held her weekly shopping. Not bad for a car a full 15 feet long and weighing over two tons. By now, it was getting dark and the final challenge of the day arose – turning on the lights. Numerous old unmarked switches seemed to control them but it took Luisa getting out to see what was happening. Even then, the dashboard lights were so feeble that I couldn’t be sure we’d actually got as far as the speed limit. On Sunday morning the idea was to have a nice day driving back to London via a pub lunch and a walk in the Spring countryside. But Saturday’s fine weather was replaced by rain clouds and, like the car generally, this adventure probably didn’t quite live up to the dream. But it was fun.